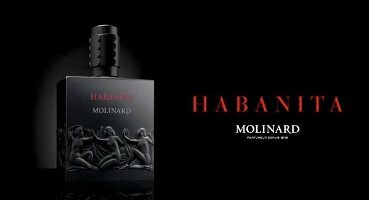 Molinard was established in Grasse in 1849, and is best known for the iconic Habanita (1924). The company is still family-owned, and popular lines in modern times include the Autour de La Vanille collection. In 2005, Molinard launched the Molinard 1849 collection, re-issues of seven of their classics: Habanita, Gardenia, Verveine de Molinard (1948), Iles d’ Or (1929), Un Air de Molinard, M de Molinard, and Nirmala (1955) in liquid and in perfume solid form. In 2008, Molinard created Histoire de Chypre as an exclusive for Aedes. See review for Tendre Friandise (2003). Selected recent releases include Fleur de Chocolat (2008), Molinard 160 (2009), Patchouli Intense (2010), Eau de Molinard (2011), new version Habanita (2012), Habanita L’Esprit (2013), La Collection Privée Acqua Lotus, Ambré Lumière, Cher Wood, Rose Émois & Secret Sucré (2014), Habanita La Cologne (2016), Le Rêve Nirmala (2017), Les Amoureux de Peynet (2017). The more obscure fragrances are best purchased directly from Molinard (see link below). For better known scents, in the US, try the discounters or Hampton Court. In the UK, try Rouillier White. See all articles on Now Smell This tagged Molinard.